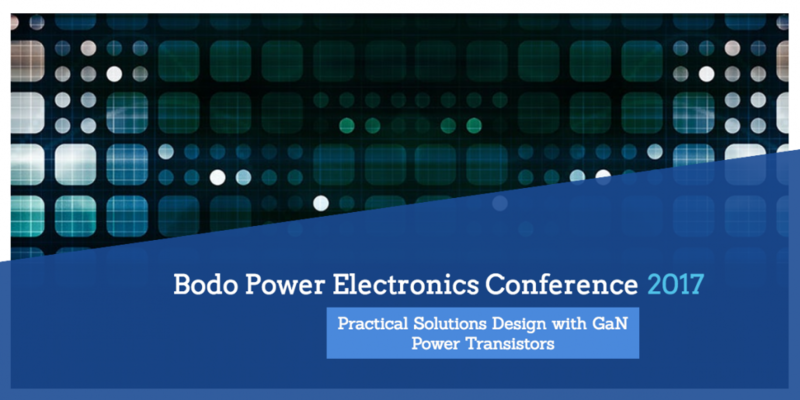 On December 5, 2017, I attended and presented at the first Bodo Power Electronics Conference, in Munich, Germany. 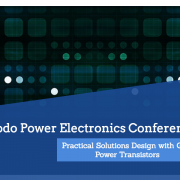 Bodo Power Systems and ICC Media/AspenCore Europe organized this one-day conference, focused on Wide Band Gap Semiconductors. The conference brought together leading experts in the areas of Silicon Carbide (SiC) and GaN and showcased that Wide Band Gap transistor technology, and GaN E-HEMTs in particular, are now mainstream and at the forefront of leading power electronics applications. My colleague and I attended all of the GaN and SiC sessions. Afterwards, we compared notes, and what I found particularly interesting was that many individuals who attended the SiC workshops and use SiC were talking about GaN! Their discussions focused primarily on the benefits of GaN. With the many successes companies are realizing with GaN, the interest in and use of GaN only continues to grow. In my opinion, in a short period of time, GaN will be the leading transistor technology. Today, discrete solutions dominate in GaN… and in the future, there will be a combination of Discrete, 3D integrated and monolithic chip integrated solutions. Why is this? We’re now in the early mass production period – creativity is flourishing as the raw performance of the GaN transistor is exploited. All the initial designs are discrete as engineers look to set a new power density record, smash an efficiency barrier, or build the smallest-ever system. These milestone designs need the freedom and flexibility of individual devices so they can be combined into the best systems possible. In other words, system optimization. Is there a precedent for this integration versus optimization question? Yes, for sure. For example, Texas Instruments has over 150 different MOSFET and IGBT Driver ICs! Silicon Labs announced a new isolated driver family Si87xx with 41 different options. FORTY ONE! Why? The industry wants optimization. However, in cases where a common design is confirmed by many companies as the best, standardization begins and integrated devices will start to be used for some of these applications. The first step in integration is 3D packaging and then the next step is monolithic chip devices. Eventually, segments with varied solutions and high power segments remain discrete for optimization reasons. For high volume, low power segments, the ‘optimize, then integrate’ scenario will play out in GaN as it did in silicon over the past decades, some with 3D packaging solutions, some with monolithic chips. When we talk about GaN and its cost, we need to go beyond the transistor cost and look at the big picture. As discussed at the conference, GaN E-HEMT based power electronic systems are clearly recognized as providing lower BOM cost solutions. In fact, the cost discussion has moved away from Si vs. GaN costs, to discussions on how GaN helps not only system costs, but also its impact on OPEX and CAPEX costs. For example, today, a GaN transistor might cost more than Si MOSFET, but you achieve a reduction in other parts of the system – from lower material costs in magnetics, capacitors and heatsinks to better efficiency and higher power density. Area and volume reduction are significant cost savers. With better efficiency, you save cost also, some estimates are $2 per watt saved. Additionally, you have lower energy requirements and increased reliability because you now have less heat and fewer parts in your system. All of these benefits combined results in lower operating costs, lower repair costs, and lower total cost of ownership. In conclusion, without question, the conference was a great day of presentations, discussions and networking, and I look forward to the next gathering. And lastly but most importantly, to add to the day’s excitement, AspenCore media interviewed my colleague Tony – all of us at GaN Systems can’t wait to read the interview when it’s published! For more information on GaN Systems, visit www.gansystems.com.